Notes for the floral fragrance include gardenia, orange blossom, green tea, cashmere, musk, amber and precious woods. Santa Maria Novella Cinquanta is available in 100 ml Eau de Cologne. 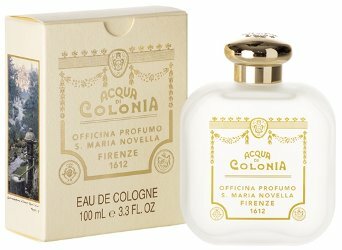 The notes in this one sound nice plus Santa Maria Novella fragrances are over-priced. I did not mean over-priced. I thought I typed fairly priced. I agree on both points. Unfortunately I didn’t like Citta di Kyoto, but perhaps this will be a win! Then I agree! I still haven’t seen the last one or two releases here though…. The Santa Maria Novella shop is so lovely in Soho. They are always kind enough to messenger my items to my office since it is difficult for me sometimes to get Downtown during the crazed workday. I often hope as I continue to get old that my need to own so many fragrances will diminish. I never go anywhere really but to dinner or drinks with friends, I don’t even have anywhere to wear all of these fragrances anymore. As I say that, I am already contemplating whether to get CdG Palisander again. It’s been a long time? 2007.